They say the chances of anything getting on TV are as low as anything coming from Mars. But, just like those pesky Martians in War of the Worlds, still they come. Now play dramatic futuristic chords and Richard Burton’s apocalyptic voice in your head. Okay, so those odds are actually a lot lower than the chances of inter-planetary invasion, but the telling point is that these are scripts coming from producers. I’m not flagging this up to put you off. If you want to be a comedy script writer and you do what needs to be done – write a script, then rewrite it until it’s brilliant, write another, repeat process – then you won’t be put off. And you shouldn’t be. It’s a rejection business, but still they come. It’s simply useful to know the reality in the hope that it both ups your game and helps you to avoid descending into bitterness. If you get some interest from a producer in your script then this shows you are already doing well. Producers do pick up on good work and they want to get shows made. After that it’s a case of timing. a) It doesn’t fit the channels needs. Different broadcasters are looking for different kinds of shows and those needs change over time as shows get picked up or cancelled. b) There is something similar in development – this can be very vague and can reference shows that don’t seem very similar at all, but this is because the channels have to look at the mix of shows. So what seems very different to you, isn’t to them. c) There just isn’t a slot. There aren’t many slots for sitcoms, so they get filled. d) They love it but can’t convince the genre boss / the channel boss / the marketing people (in the case of commercial channels). e) The talent isn’t big enough. Channels are talent obsessed. And with understandable reasons. Of course it is very difficult to attach talent to your script and if you think it’s easy for even big production companies, it’s not. There’s probably a whole other blog on this, but there isn’t time here. f) Insert other nebulous factor. There are probably loads of other reasons, but that’s everything that’s come into my head right now. I’m not sure what there is to learn from this, but it is useful to know. It doesn’t deter me and it shouldn’t deter you. 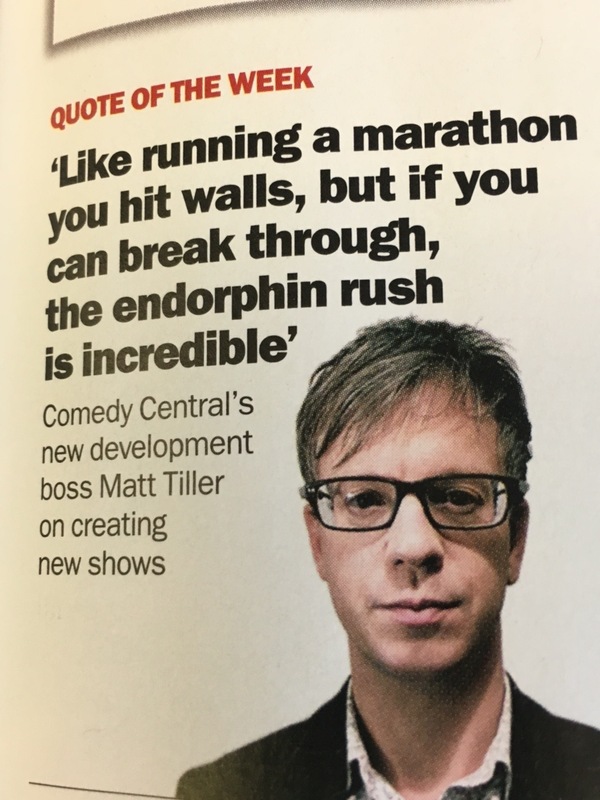 It makes me want to develop more interesting ideas and find shows that are brilliant, different, and will make a mark. Got to go now, a Martian’s just turned up with a spec sitcom script. What are the chances?